WTF Am I Supposed To Do With This?! I came home the other day and there it was. 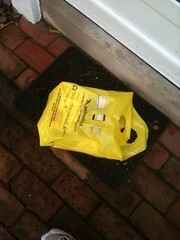 The annual bag with our new yellow pages. The one that we always just take out to the curve…eventually. Sometimes it sits there for a few weeks, get’s soaked or frozen, or both, because really, in the age of Google, what the hell is the point of the Yellow Pages? To take up space? Arlington accepts phone books with recycling, as does DC. You could rip it in half. I believe there’s a holiday that celebrates feats of strength. You could use it to bulletproof your car on the cheap, alla Burn Notice. What’s especially frustrating is that in addition to the “official” phonebooks you almost always get one or two EXTRA yellow pages put out by different publishers, plus local guides put out for your specific municipality, etc., etc. While it’s good to hear that recycling accepts these books, it still seems a little outrageous that for-profit companies can wander through the neighborhood dumping unasked-for trash on everyone’s doorstep without facing any consequences. At the very least it seems like they should have to pay a substantial “future recycling fee” in each jurisdiction where they distribute their books. maybe if I post this without the link it will work? there IS a way to opt out of the yellow pages. Thanks DG-rad, I just did it. Now let’s see if it works. We own a row house in DC and we get TWO of these damn things just because we have an front basement entrance, despite the fact we do not rent it out. I replied, “No problem, just hand them to me.” Then proceeded to wave the book to the van he pointed out, walk to the recycle bin and toss them right in. We still got them this year. Grr…hope this website works! Nate, I love your idea. Let’s extend this to unsolicited mail order catalogs, too. I’ve found companies are very good at saying “of course we’ll take you off the list” and then continuing to send the things anyway.